The Bureau of labor statistics gives detailed information about the salary earned by a certified nursing assistant. As per the survey conducted by BLS in May 2013, the average nursing assistant salary in Montana was $24,810 annually and 11.93 hourly. The state employed 5,300 nurses in the same year, and the employment per 1000 jobs was 12.06. As per the data on indeed.com, as of January 2015, the average RN salary in MT was $20,000. The Average CNA salary for job postings was 17 percent lower as compared to other job postings on a national scale. 90% of CNAs made less than $30,750; 10% made more than $30,750. 75% of certified nurse assistants earned less than $27,930; the remaining 25% earned more than $27,930. 50% were offered less than $23,940; rest 50% offered more than $23,940. 25% were paid annual wages less than $21,490; 75% were paid more than $21,490. The working location of a CNA plays a major role in calculating their salary. From the table shown below, it can be concluded that CNAs working in Kalispell city remunerated with the highest median annual salary ($27,907). On the other hand, Bozeman and Missoula were the lowest paying cities with median annual salary of $18,463 and median monthly salary $1,539 as on January 2015. The designation held by a nursing assistant decides their salary. 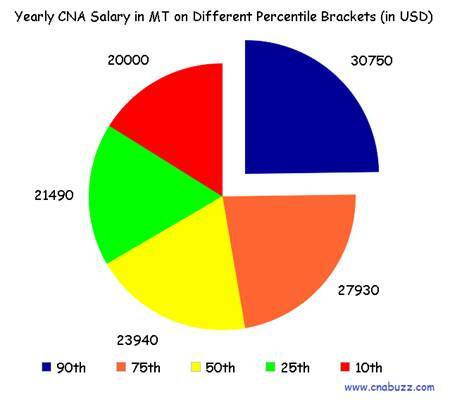 Among all the positions, CNA Hospice receive the highest pay i.e. $26,000. The job title receiving the lowest salary is Correctional Prison Facility CNA i.e. $12,000. Have a look at the table given below to know the wages for each and every designation. With the increasing population and growing rates of dementia along with other chronic diseases, one can witness development in medical facilities too. Thus, the demand for the nursing assistants is rising day by day. The job opportunities of nurse aides are predicted to rise by 21% in the impending years (according to the Bureau of Labor Statistics). Among numerous existing jobs available, this profession is the most preferred one. However, the need of CNAs may be constrained since various nursing homes depend on government funding. Question 1 – Presently, I am employed as a CNA in the state of Nevada, but due to some personal reasons I am planning to move to Montana. What average salary can I expect there? Answer – According to indeed.com, aspiring CNAs can expect an average salary of $20,000 in Montana. 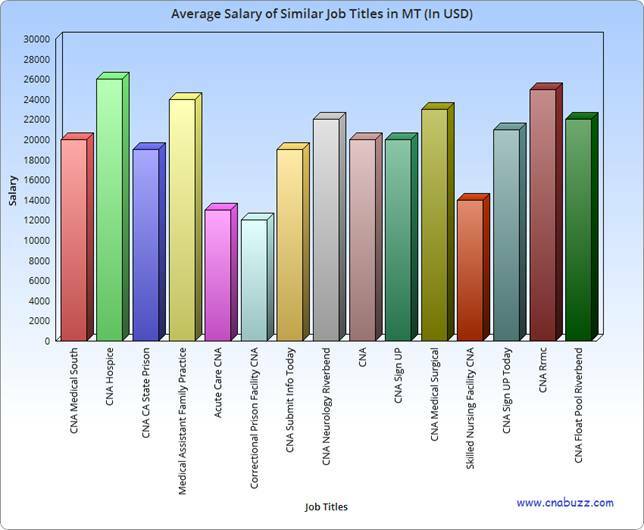 Question 2 – Can anyone suggest me the top paying job titles in Montana? Answer – In the state of MT, the highest paying job title is CNA Hospice with average salary $26,000. Other such job titles include Medical Assistant Family Practice, CNA Rrmc, CNA Neurology Riverbend and CNA Medical Surgical.